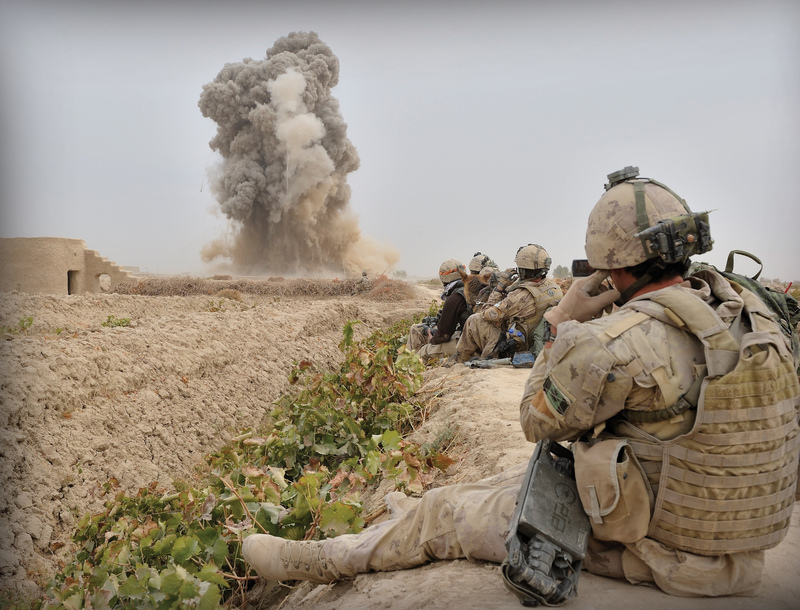 Members of the Royal Canadian Regiment Battle Group plug their ears as a cratering charge, used to clear cave entrances and other structures, detonates in Panjwaii District in 2010. The profession of arms is hard on hearing. The roar of engines, thunder of artillery, ear-splitting shrill of sirens, high hum of an engine room, jackhammering of weapons fire, piercing clang of metal on metal—even the joyful sound of instruments in a marching band—take a toll on the ears of members of the Canadian Armed Forces. Federal noise regulations consider hearing is safe at exposure to 87 decibels over an eight-hour workday, with the length of safe exposure time decreasing as decibels rise. Noise from artillery can reach 184 decibels. 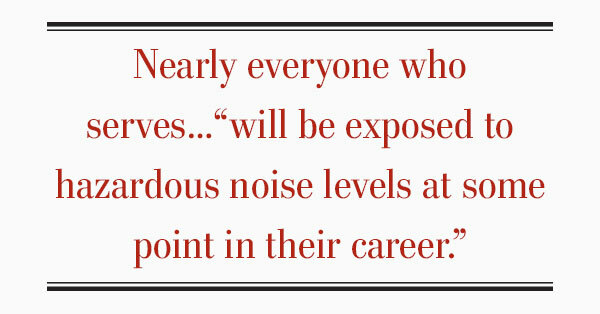 At least two-thirds of the CAF’s personnel—more than 43,000 people—are exposed to loud noises at work, according to a study presented at the 2017 Canadian Institute for Military and Veterans Health Research forum. Still, only a third of personnel always protect their hearing, and about 2,600 report they never do, said the report by defence department and university researchers. Another researcher reported that personnel understand the risks of exposure and benefits of protection, but sometimes choose not to use protection, for instance, when it would put them at a tactical disadvantage. “Personnel must be prepared for high intensity sounds while also being able to attend to faint noise cues,” says the CAF 2013/14 Health and Lifestyle Information Survey, in which regular force personnel reported noise as the biggest harmful health effect on the jobsite (training and deployment aside). “Military members are constantly faced with multiple sounds and noise disruptions that all compete to be heard,” notes the Defence Research and Development Canada (DRDC) website. A study in 2004 found a significant proportion of members across 17 trades were concerned that hearing protection would interfere with what they must hear. Hearing loss and tinnitus are the most prevalent disability benefit diagnoses among Second World War and Korean War veterans, and second most prevalent among modern veterans, says a 2016 article in the Journal of Military, Veteran and Family Health. Based on data from the 2010 and 2013 Life After Service studies on reserve- and regular-force veterans, the study revealed that hearing problems were “considerably more prevalent” overall and at younger ages in CAF veterans than the general population, mirroring the data on serving members and civilians. The study also noted that veterans and serving members report hearing problems earlier than problems are picked up in hearing tests, which, it notes, are conducted in unnaturally quiet conditions, versus the variation in tone and loudness experienced in the real world. Loss of hearing has a big effect on quality of life—especially if veterans avoid socializing due to frustration and irritation and they are ostracized by family and friends leery of awkward encounters and grumpiness. Other health effects include fatigue and increased stress, depression and loneliness, increased safety risk and impaired memory. It affects serving members, too. “Hearing loss represents significant operational and financial loss to the CAF because of the disruption it can cause to a mission and the support required by members who experience hearing loss,” according to DRDC. DRDC is working with researchers from other countries to develop standards for measurement and analysis of noise produced by different weapons, to create guidelines for protecting hearing on the battlefield. For six decades, the Canadian Armed Forces has been concerned about conserving the hearing of its people, and has developed programs to measure and reduce noise where possible and provide hearing protection devices and training in how to use them. It conducts hearing tests of personnel under 40 every five years and every two for older personnel. Aging and exposure to a combination of long and loud noise account for most hearing loss, but so does exposure to solvents. The 2004 study found that many members were exposed to solvents and the use of respirators was not common. The study also revealed that some noises penetrate hearing protection, some gear is too uncomfortable to wear for a whole shift, and hearing protection equipment is impractical in some trades, such as communications, where operators must listen to multiple radios and telephones. Changes to the hearing protection program were made to counter some of these issues, while solutions to other problems are still under development. Meanwhile, researchers in the United States have discovered that the inhibiting action of an enzyme that stimulates production of toxin in cells protected mice and rats from noise- and drug-induced hearing loss. Researchers at St. Jude Children’s Research Hospital tested 4,000 drugs, many of which were approved for other treatment, for the ability to protect cochlear cells from cancer medications. Injecting this inhibitor into the middle ear protected the mammals from hearing loss due to a cancer drug as well as noise up to 100 decibels. Though the research was done on animals, it is expected that the enzyme inhibitor will have the same effect in humans. If so, it could save millions the world over, including serving military personnel, from hearing loss.